After I learned how to solve a 3x3 Rubik's Cube and a 4x4 Rubik's Revenge, I began challenging myself to solve the cubes to different states rather than the normal solid sides. For instance, I'd solve the cube like normal, except with all the edge pieces flipped. When I tried to solve the cube like normal except with the centers rotated, I ran into an interesting problem on the 3x3 that doesn't happen on the 4x4. When you exchange the centers on a cube from the solved state, they are swapped in two groups of three. This works for both the 3x3 and 4x4 (as expected), shown in the images below. When you solve to (by "solve to" I mean go from scrambled to this state, without solving all sides then trying to get here) these states, it works fine, no problems. However, the other way to exchange centers is by three pairs rather than two triplets. This works fine for the 4x4, shown below. When you try to solve to this state in the 3x3, something strange happens. Everything solves like normal, except for the last two corners. Normally, this is an illegal state that should never occur, which left me very confused. If you think of the centers as one cube and the sides as a whole separate cube, they both still work, meaning all the colours are in the right spot (with relation to one another). This is shown below. I doubt there is an algorithm to solve this, however I am very curious why this happens. The cube solves normally, the corners haven't been switched or anything. I can't find this happening anywhere else on the interwebs, so maybe you guys can suss it out. The problem that occurs on your 3x3x3 Cube is called Void Parity. When you solve a Void Cube you can have everything solved, except for two swapped corners. This is due to the "centers" not being at the correct place. A 90° slice turn is a 4-cycle of edges and a 4-cycle of centres. A 4-cycle is an odd permutation (means an odd number of swaps is needed to reach the original state). Your situation shows an odd parity of edges whereas the corners are solved (= even permutation; 0 swaps needed to reach the solve state). Doing a 4-cycle (i.e. a 90° slice turn) will switch the parity of edges from odd to even. The parity of centres switches too (this is invisible on a Void Cube, but visible on your 3x3x3 Cube). A sequence to solve the Void Parity on a Void Cube: R F' L2 F2 U' D R' F B' D' F2 D F' If you do this algorithm on a solved Rubik's Cube, you'll see the single swap (i.e. an odd number of permutations) of edges AND a 4-cycle of centers (a second odd number of permutations of another piece group). In short: Any outer layer turns of the cube produce an even permutation - a 4-cycle of edges, and a 4-cycle of corners. On a regular 3x3, a slice move does a 4-cycle of edges and a 4-cycle of centers. However, on a void cube, it's just a 4-cycle of edges (an odd permutation). The way you ignore the centers while they are off by 90 degrees, causes the same issues as with a Void Cube. This doesn't answer the Void Cube parity in particular, but should give a more general understanding of what Twisty Puzzle Parity is, and why it occurs on some puzzles (like the 4x4x4 Cube). Even permutation + Odd permutation = Odd permutation. Here you have an Odd Parity, or just parity for short. If you start with an even permutation (let's say a prankster twisted a single corner, or swapped two corners), it doesn't matter how many moves you make, all you can do is even permutations, and a single twisted corner or single swap is an odd (one twist / swap) permutation, so you'll never be able to solve it (unless you twist / swap them back manually). swap A and D, giving DABC as required. An even permutation is defined in a similar way. Are there any permutations that are neither odd nor even, ie can't be written as a sequence of swaps at all? Are there any permutations that are both odd and even, ie by changing the sequence of swaps for an alternative, the number of swaps switches from odd to even or vice versa? The answer to both these is 'no', which I think it's fair to say is not all that surprising in the first case but quite remarkable in the second. 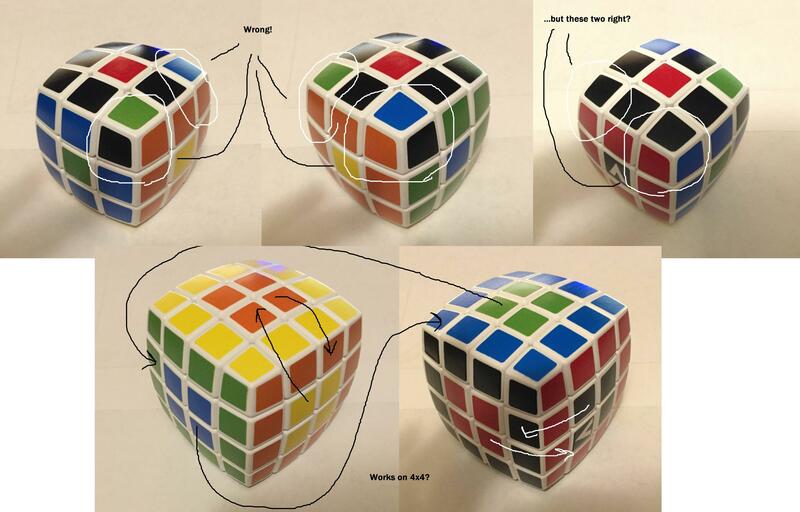 When considering permutations of the Rubiks Cube, it's often easiest to consider the centre squares as fixed, but here I think it's going to be easier to think of them as movable and instead consider the absolute position of the pieces relative to, North, South, East, West, Up and Down, say. There are then three sets of pieces that could potentially be permuted by a movement of the cube: edges, corners and centres. What you're trying to achieve is an odd permutation of the centres: it can clearly be written as 3 swaps and therefore it will always require an odd number of swaps. At the same time, you're doing even permutations of the corners and edges, as each can clearly be written as 0 swaps! That means that the total number of swaps across the three sets must be odd. But what cube moves can possibly achieve this odd total? Moving any side of the cube does a 4-cycle of the edges and a 4-cycle of the corners. Each of these permutations is odd, as illustrated above, but when added together the total number of swaps will therefore be even. Similarly, moving a middle slice will do a 4-cycle of the centres and edges, again leading to an even number of swaps overall. Hence any movement of a Rubiks cube effectively performs an even number of swaps, so you will never be able to achieve the odd total that you're looking for. Edit: ...sorry, should also have said that the 4 by 4 case is different because there are a different number of 4-cycles involved. Swapping the 3 centres now involves 12 swaps, as each centre contains 4 pieces, so is an even permutation. Meanwhile, odd permutations are suddenly possible anyway, as a middle slice move will perform a 4-cycle of edge pieces and two 4-cycles of centre pieces, so that's now an odd number of swaps in total. Not the answer you're looking for? Browse other questions tagged logical-deduction rubiks-cube algorithm or ask your own question. Why does the 4x4 Rubik's cube have parity cases, while the 3x3 does not? 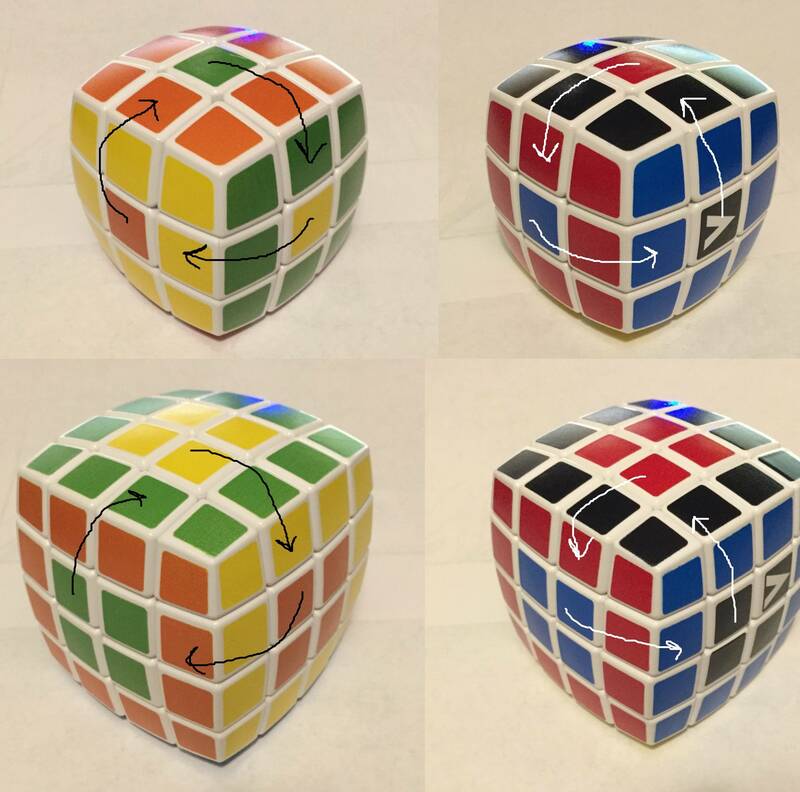 How to determine if a Rubik's Cube is sufficiently scrambled?